Research for Action (RFA), a Philadelphia-based non-profit research organization is conducting an independent, 3-year evaluation of Blueprint, to analyze the quality of implementation and impact on teachers and student outcomes. In this rigorous study, RFA is assessing Blueprint's implementation in Philadelphia Pre-K centers. They also assessed the professional development we provide through training workshops and one-on-one coaching. The year 2 results have found Blueprint has a substantial impact on Pre-k students and teachers. Children in Blueprint classrooms outpaced their peers in literacy skill development. Children in CLI-served classrooms made 2-3 months of additional progress in vocabulary development compared to children in similar classrooms not supported by CLI. Nearly all (96%) of surveyed Blueprint teachers reported their students had made “quite a bit” or “a great deal of progress” in language and literacy activities since Fall 2017, and attributed student progress to supports from CLI. Figure 1: Receptive vocabulary among students in Blueprint and comparison classrooms. Nearly all (85%) of Blueprint teachers reported high levels of knowledge about effective practices, compared to 73% of teachers in comparison centers. Nearly all (96%) of Blueprint teachers reported feeling able to implement best practices, compared to 73% of teachers in comparison centers, a statistically significant difference. Pre-K teachers share how Blueprint enables them to implement best practices. Children in Blueprint classrooms showed increases in engagement from Fall to Spring in language and literacy activities, compared to children in comparison classrooms. Most Blueprint teachers (89%) and comparison teachers (82%) reported high levels of student engagement in language and literacy activities. Blueprint lead teachers reported feeling “very satisfied” with their job, while just over a third of comparison lead teachers reported the same. This difference, however, is not statistically significant. Survey results suggest that Blueprint positively impacts teacher work environments, reducing stress and increasing job satisfaction. 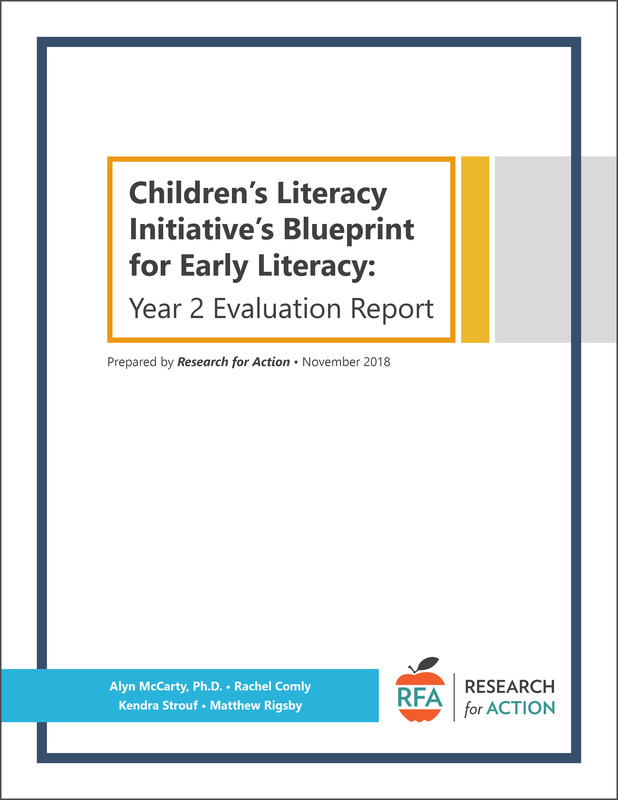 We are thrilled to share the results from Research for Action's independent evaluation of Blueprint for Early Literacy. Download the report below.